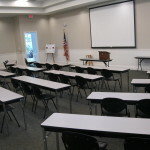 We offer our 5100 square foot Education Center as a rental option for full and half day events. Our facility can be divided into two separate rooms. Please Click Here for contract information. Contact RAIRC Staff for further details at 772-567-3510 or email Communications@RAIRC.com. *Rentals over 3 hrs require regular rental rates/fees. **No food or drink allowed with this rental rate. ***No use of equipment except tables and chairs. ****Refundable key deposit ($100) & Security Deposit ($100) will apply.